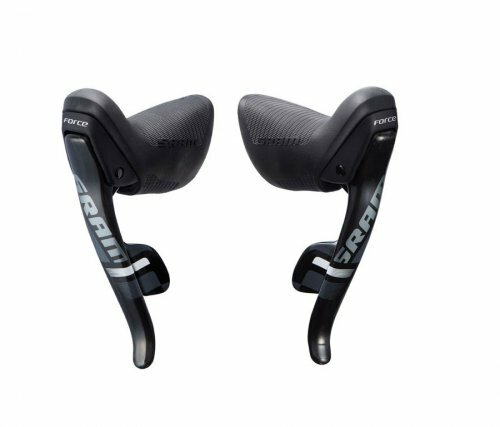 The new SRAM Force 22 ErgoDynamic™ Shifters were modeled after the best in class comfort of SRAM RED, and represent our most advanced thinking yet on perfecting the interface between rider and bike. Everything received the same detail, including the transition between handlebar and hoods, the grip texture, finger wrap, and the separate interfaces with both the shifter and brake lever. The understated black finish makes it look fast and a perfect match for any machine. • Incredibly light weight at the bars, improving handling and control, at 307 grams. • ErgoFit textured body improves grip and finger wrap with reduced diameter, providing better control, and a better transition to the bar. • Individual Reach Adjust™ of brake and shift lever, now easier to access and uses a standard hex key, puts the controls exactly where you want them. • Larger ErgoBlade lever improves shifting from the drops. • DoubleTap® technology delivers both shifts from the single lever. • ZeroLoss™ shifting, shifts engage immediately. • New clamp allows better fit and adjustment for modern carbon and ergo bars. DoubleTap technology makes the leap to the flatbar 9 and 10-speed bikes, delivering smooth up and down shifts are lightning fast. The shift lever is adjustable for quick customization and the gear indicator is easy to see for quick reference. It consists of three separate elements to significantly improve your riding experience on SRAM DoubleTap controls. The brake lever is slightly longer than previous DoubleTap road controls to enhance the reach from the drops. The independent reach adjust features on the brake and shift levers are easier to access to quickly adjust for every hand size. Finally, the shape of the hoods has been completely redesigned with a smaller diameter and higher top shape to increase the rider’s control and improve finger wrap. Zero- Loss simply means, well, zero loss—when you push on the lever, for an upshift or down shift, the cable is engaged instantly—zero loss of movement. There is no middle-ground where you're waiting for the shift to come. Gear changes are instant and precise.